Within the entertaining pages of many children’s books lie profound teachings about the natural world that can help children develop an educated and engaged appreciation of the dynamic environment they inhabit. 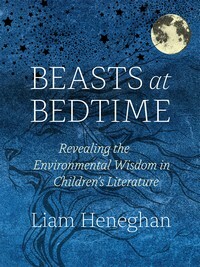 In Beasts at Bedtime: Revealing the Environmental Wisdom in Children’s Literature (University of Chicago Press, 2018), BEI Resident Scholar Advisor, scientist (and father) Liam Heneghan examines the environmental underpinnings of children’s stories. This book enthralls as it engages. Heneghan as a guide is as charming as he is insightful, showing how kids (and adults) can start to experience the natural world in incredible ways from the comfort of their own rooms. Beasts at Bedtime will help parents, teachers, and guardians extend those cozy times curled up together with a good book into a lifetime of caring for our planet. DePaul’s University’s Institute for Nature and Culture is hosting the launch event for Beasts at Bedtime on Wednesday, May 2nd, at 7:00pm. Copies of the book will be available at the reception.